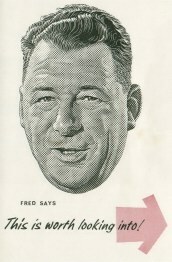 Fred Pontin was born in London's East End on October 24th 1906 and went on to have a successful career in the city's Stock Exchange. During the war years he became involved with helping to establish hostels for construction workers and, using this experience decided to venture into the holiday business by forming a company to buy an old disused camp at Brean Sands in 1946. The asking price was £23,000 with Pontin supplying 50% (helped by a substantial loan from Barclays) with the remainder coming from various city investors. The small eight acre site had been open since the 1930s and had recently seen use as a US Army base. It was in a pretty bad state and consisted of nothing more than a motley collection of semi-derelict wooden huts with accommodation for 200 people. After a quick revamp, and an advert in the Sunday Express, the site opened for business and was soon swamped with holiday makers. 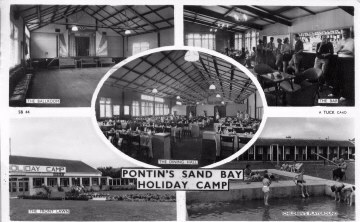 Seeing the success of his first venture Pontin immediately went on the acquisition trail and within weeks had snapped up a second camp at Osmington Bay near Weymouth. He then transformed the business into a publicly quoted company on the London Stock Exchange and additional funds were raised to purchase an additional four camps the following year. This set the pattern for future expansion, he'd usually buy up existing camps and give them a Pontin makeover. Some of the camps were bought privately and run by himself for a year or two before being transferred to the company of Pontins Ltd in exchange for additional company shares. Camps were hardly ever built from scratch and were always much smaller than the mammoth sites being run by Butlins. 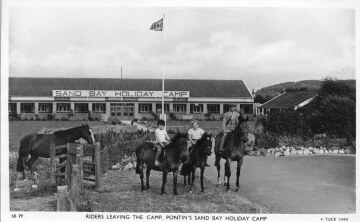 By 1947 the six Pontin camps had a total combined capacity of 1,300 people. Butlins had five camps with a total capacity of over 30,000 people! Pontin never had any desire to copy this and always insisted that smaller camps were more manageable and cost effective. The lower overheads were also reflected in the prices and a week at Pontins was always much cheaper, albeit without the huge range of entertainment and attractions. During the summer of 1965 a week full-board at Butlins cost around £16 per adult - the same week at Pontins was just £10. Fred Pontin and Billy Butlin always had a strong but friendly rivalry. Butlin once paid a secret visit to the Pontin camp at Brean Sands and nothing more was heard until several years later when a photograph surfaced of him drinking in the camp bar. Pontin jumped at this wonderful publicity and the picture appeared in the following years brochure with the slogan "All the best people come to Pontins!". Butlin was apparently none too pleased. The expansion continued with the acquisition of a camp in Ireland as well as an upmarket manor house near Torquay named Barton Hall - in 1963 this became home to Britain's first outdoor artificial ski slope. The 1960s saw some major developments in the holiday camp industry with Butlins opening three massive new centres. Pontins responded with more acquisitions and the empire grew to include sixteen camps including expansion into the island of Jersey. A couple of brand new centres were also built on greenfield sites and one of these (Prestatyn) later featured in the 1970s movie 'Holiday on the Buses'. The 1960s also saw the introduction of the Pontin Bluecoats, a sneaky copy of their famous Red counterparts at Butlins (Warners had their Greencoats). Famous ex-Bluecoats include Shane Ritchie, Brian Connelly, Bradley Walsh and Gemma Craven. Butlins were still providing somewhat basic food and accommodation and were focusing all their energies on bigger and better entertainment. Realising he could never compete in this area Pontin decided to instead focus on improved accommodation and by carrying out a major revamp of the catering department. Chalets were equipped with such luxuries as en-suite bathrooms and televisions, then unheard of at Butlins. Traditional dining halls were replaced with wide ranging self-serve buffets. Pontin also pioneered the use of self-catering, an idea that Billy Butlin had always opposed. It wasn't until his son Bobby took over that self catering first appeared at Butlins. Pontin was also responsible for helping to start the foreign package holiday craze in the 1960s with the construction of a new hotel in Sardinia. He could offer a two week holiday with flights, accommodation, food, drink, entertainment (and guaranteed sun!) for less than £50. The venture was successful and Pontinental Holidays was formed to build additional hotels and camps in Majorca, Spain and Ibiza. He also took over a Belgian company which added a further six sites to his growing Mediterranean empire. In 1978 the company was sold to betting company Coral in a £56 million deal which Fred Pontin later regretted. In 1980 Coral (including Pontins) was bought out by brewing giant Bass who later disposed of the Pontinental side of the business. In 1987 Pontins was sold to a management buyout team lead by Trevor Hemmings & Graham Parr. Trevor had been involved with Pontins since the late 1960s when his construction company had built the new camps at Southport and Prestatyn. He later sold this company to Pontins in return for a substantial shareholding and a seat on the board. In 1989 Pontins was sold yet again, this time to Scottish & Newscatle. Over the next 10 years the company made some major changes which included the sale/closure of a number of sites. In 1995 the remaining camps benefited from a much needed 3-year £55 million modernisation programme which helped to make up for the lack of investment over the previous 15 years. But the company was still not producing the expected returns and in 2000 it was sold back to Mr Hemmings although only 8 camps now remained. Mr Hemmings is now a major player in the UK leisure business and one of the wealthiest men in the country with assets of around £500 million. In 2008 Pontins was sold once more! This time it was Graham Parr's time to return to the holiday company with his company, Ocean Parks buying Pontins for £46 million. However, the company went into administration in November 2010 and it was announced in January 2011 that Britannia Hotels Group, who already own some of the former Butlins hotels, would be purchasing and continuing to run the company. It's thought that they're paying in the region of £20 million for the remaining 5 camps - a sharp mark down from the £46 million which Ocean Parks paid for the company just a few years earlier. Although Fred Pontin had deep regrets over the sale of his company, in hindsight it was a good move as the holiday camp industry was set to suffer some major declines throughout the 1980s. He decided that retirement wasn't an option and involved himself in a number of new leisure interests including the London Dungeon and a handful of small but exclusive hotels in the West Country. He spent his later years living in Blackpool and it was there that his remarkable life ended on September 30th 2000 at the age of 93. Any additional Pontins information and/or photos will be most welcome! These two postcards (dated 1959) show the old Pontins camp at Sand Bay near Weston Super Mare. This camp is still open today but under new ownership.